Guitarist Bryan Reichert's active music career features a great enthusiasm for performance and teaching. Reichert’s recent Cleveland area performances include Mary Queen of Peace Church, Church of the Covenant (University Circle), Case Western Reserve University, Playhouse Square, The Cleveland Museum of Art (Classical Cafe Series), and The Parma Symphony. He has also performed at Otterbein University (Columbus area) and Skidmore College (Saratoga Springs, NY). Reichert has premiered numerous works by modern artists, most notably the Armenian-American composer Loris O. Chobanian. A recording of Three Spanish Dances aired in 2015 on WCLV 104.9 FM, Cleveland’s classical music radio station. On December 10, 2016, Reichert premiered (as soloist) Chobanian’s Variations on an Israeli Theme for two guitars and orchestra with the Skidmore College Orchestra, the composer conducting. He premiered another work with orchestra (as soloist) on October 14, 2018, Three Romances for guitar and orchestra by Chobanian with the Parma Symphony Orchestra, the composer conducting. 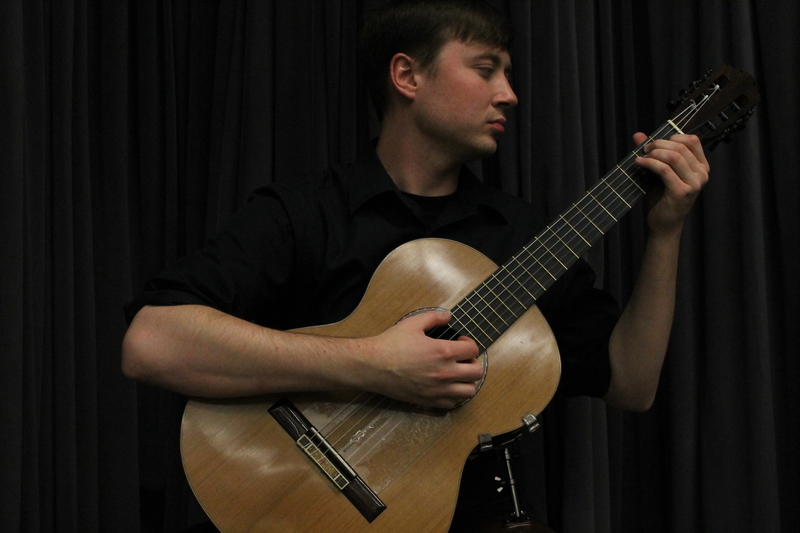 Bryan Reichert is a graduate of Baldwin Wallace University (BM 2013, Guitar Performance), studying under Loris O.Chobanian and Jorge Amaral; Cleveland Institute of Music (MM 2016, Guitar Performance), under Grammy-winning classical guitarist Jason Vieaux. Reichert is an enthusiastic private lessons teacher who currently holds a teaching position in Baldwin Wallace University’s Community Music School. He also teaches at the conservatory level, instructing both Beginning and Intermediate guitar courses at Baldwin Wallace Conservatory. In addition, he works with the Cleveland Classical Guitar Society as Director of Operations (2016 to present) and had previously held the position of Education Outreach Coordinator for the organization’s Education Program.